We’ll be the first to admit it: living with a runner isn’t always easy. You have to hear the alarm go off in the dark when he (or she) wakes up for an early morning run. You live with muddy shoes and sweaty clothes strewn all over the house. You can’t go 2 days without hearing about some past or upcoming race. It’s enough to drive you crazy sometimes. The good news is that when December rolls around, runners are extremely easy to shop for. With that in mind, here are some last-minute gift ideas for that obsessive (and sometimes irritating) runner in your life. Most of these can be picked up locally at The Treadmill, Fleet Feet, or REI stores as well as online - see our archive webpage for good product links. **Online version: all links are to product pages on Amazon.com or other online vendors. 1. Moisture-wicking cap and/or gloves. Cold-weather running is especially harsh on exposed fingers and ears, so if your runner doesn’t already have a nice moisture-wicking cap or gloves, these will be a welcome sight in the stocking. Sugoi makes a great Firewall LT glove and subzero skull cap to keep you warm on cold mornings. 2. Reflector vest or headlamp. Winter brings extended darkness, and your number one priority on the roads is safety. Most running apparel today has reflective accents, but if you really want to stand out, a thin mesh reflective vest will ensure visibility from hundreds of feet away. Headlamps are doubly effective in that they can be seen from farther away by oncoming traffic, and they also help the runner see any hazards in the road. One lamp in particular, Black Diamond's Sprinter, has an additional blinking LED behind you for even more safety. 3. Car seat cover: Your runner probably drives somewhere for a workout; after the run, chances are that he sits back behind the wheel with muddy calves and sweaty clothes, perhaps on top of an old gym towel. A car seat cover has fabric on one side and an impermeable plastic on the back side, can be tossed over the seat in seconds, and is machine washable. And it’s a lot cheaper than shampooing your car upholstery. 4. CLIF Bloks: These are a chewy version of energy gels, and CLIF makes the best flavors going, including a new citrus flavor introduced this fall that is fantastic. 5. Socks: In the words of Hogwarts headmaster Albus Dumbledore, “One can never have enough socks.” Mike likes Balega, Donald likes Drymax. Your runner may vary. 6. GPS device: These used to be big-ticket items, but the price of technology gets more affordable every year. A company called Soleus makes a wrist-mounted GPS that’s as small as a watch and as accurate as a big-ticket Garmin – all for less than $100. 7. WNLR membership: Every runner needs some kindred spirits, and the Wednesday Night Laundry Runners have members to match nearly every talent level and type of running you can think of. For annual dues of $15 you get social gatherings and running store discounts as well, making it one of the best deals going. Send us an e-mail for details. 8. 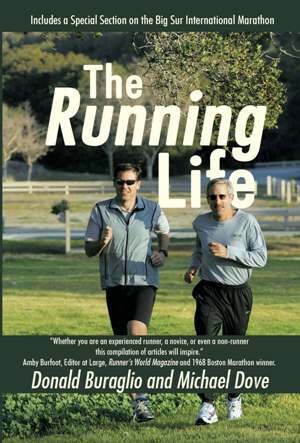 The Running Life book: Did you think we’d forget to mention our book? If you know a novice runner, someone who is training for the Big Sur marathon, or anyone who enjoys life from a runner’s perspective, this would make a perfect gift under the tree. It’s available for purchase from our website - see the sidebar at top right.